If you think that you can't possibly teach your child to read, then I have a product to share with you that will put those thoughts to rest. Academic Success for all Learners has created a simple reading tool that is being used in different learning environments all over the world. The product - Little Books. 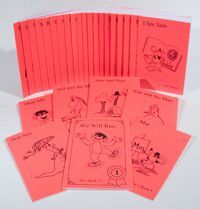 The Little Books program is a sequence of 141 color coded books. There are 8 sets of books from Kindergarten to 3.6 reading level. Each set contains up to 27 books. I actually started with Set 1 and I have a 3rd grader using those. This set is for beginning readers but I had noticed some holes in my daughters reading ability so I wanted to go back to the beginning to see where/what she was missing. I wanted to start easy for her as to not frustrate her anymore. These were the perfect books for that. Yes, set 1 was extremely easy for her so we read 5 books a day and I was able to see some of the sounds/words she was having difficulty with. She quickly breezed through set 1 which I expected and we began set 2. Here, she had to slow down a bit and I was able to assess what we needed to work on. Each book begins with new sounds and words that are going to be introduced in the book. It also has a review of previous sounds learned. Each book ends with sounds and words that will be introduced in the next book of the series. All throughout the book are clues for the parent/teacher that include reminders simply to praise the child for a job well done as well as simple comprehension questions. When you finish each book, your child can color that number book on a progress chart. When you complete a set, you can award your child with a certificate of completion. All forms are included with the books. The books are simple and not cluttered so the focus is primarily on the reading. Also, in each book are characters like the one below. Meet Ann! A great tool to get you started is the create your own customized instructor guide and lesson planner. Created just for your learner and ready to download today. This also includes an assessment so you can easily find out where to begin with your child. Best of all, it is free! You can see a free sample of a book and check out other free resources available here. Each set of books can be purchased here for $30 each. There are also kits, organizers, and puppets available! You may also want to browse their other products which include big books, phonemic awareness materials, flashcards, math, spelling, and more. We loved these books and can't wait to continue with the other sets! They are great tools to help you and your child be successful in reading! Here is Sarah with her books and progress chart! Don't forget to check out what my fellow crewmates thought of these and other Little Book sets. **Disclaimer: I received 2 free sets in exchange for my review. The opinions here are my honest and true evaluation!